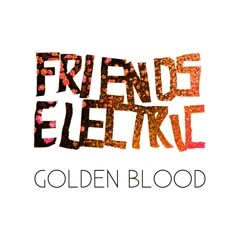 According to the band’s publicists, “Friends Electric are four friends from Neath in Wales who make rather infectious electronic pop music.” And they’ve slowly but surely been developing quite the name for themselves. So much so that they’ve already apparently been seconded to remix the likes of Ellie Goulding, Kelis and even our very own Kylie Minogue. ‘Golden Blood’ is the band’s latest single which is apparently set for a global digital release on November 29. It’s so incredibly familiar- what song it sounds similar to we can’t quite put our finger on – but if you’ve been a fan of the recent swathe of indie dance/pop meshes, you’re bound to get your kicks out of ‘Golden Blood’. Hear more HERE (there’s even a free download of their remix of Ellie Goulding’s ‘Under The Sheets’ there for all to see).